$300 Instant Savings. Expires May 2, 2019. * All prices reflect savings. What to Expect This moderately-paced, escorted Thailand tour includes a reasonable amount of walking or hiking and requires an average level of physical fitness. Discover the wonders of Thailand on our new, deluxe Treasures of Thailand vacation package. You'll encounter an ancient, fascinating culture, friendly, welcoming people, gorgeous, peaceful countryside and bustling, modern cities, and the most amazing shopping—unbelievable bargains included! Start your journey in the bustling capital city of Bangkok, and then travel by motor coach to the famous Damnoen Saduak Floating Market, the historic River Kwai and the ancient city of Ayutthaya. Next, you'll fly to Chiang Rai, Thailand's northernmost city, and visit the Hill Tribes of surrounding region. Continue by road to Chiang Mai, the "Rose of the North", where you'll discover ancient temples and mysterious ruins. But don't wait too long to reserve your spot, our groups are small, our prices are exceptional, and space is definitely limited. Instant Savings: Get $300 off if you book by May 2, 2019! 1. The Angkor Wat extension is subject to availability and requires that your flights be confirmed separately by the airlines. Please note that it typically takes 3 to 5 business days to confirm your extension flights with the airline, and that we will notify you immediately upon confirmation of the flights. This extension also requires a minimum of 2 passengers to operate. 1. The Phuket Island extension is subject to availability and requires that your flights be confirmed separately by the airlines. Please note that it typically takes 3 to 5 business days to confirm your extension flights with the airline, and that we will notify you immediately upon confirmation of the flights. This extension also requires a minimum of 2 passengers to operate. Want to fly from another city? Unfortunately, we don't offer flights from other cities, but you can book your own. Check-in for your overnight flight to Bangkok, Thailand via Taipei. Accommodations: 3 nights COMO Metropolitan, or similar, Bangkok. Included meals: Dinner. Full Day Itinerary: Today, arrive in Bangkok. After customs formalities, transfer to your centrally located hotel for check-in. Tonight, experience a romantic evening, Bangkok-style, on a lovely dinner cruise that will take you along the Chao Phraya River, passing the glittering sights of Bangkok. Enjoy sumptuous Thai cuisine as you take in stunning views of the Temple of Dawn, the illuminated Grand Palace, magnificent temples, striking bridges and other landmarks. The cruise offers a perfectly relaxing experience that you will never forget. Full Day Itinerary: The morning is at leisure to explore Bangkok on your own, or join other locally available optional excursions. This afternoon, visit Bangkok's number one ‘must see' attraction, as well as Thailand's most important landmark: the Royal Grand Palace. Your guide will take you on an in-depth journey through Thailand's history and royal heritage, where you'll be amazed at the grandeur and majesty of the building and its throne halls. This is also where you'll be treated to a special visit to see the mysterious Emerald Buddha, the most revered Buddha image in Thailand. At Wat Po, founded in the 17th century and the oldest temple in Bangkok, you'll view the amazing Reclining Buddha, whose face depicts the attainment of Nirvana and whose feet are inlaid with mother-of-pearl. Optional Excursion: Old Bangkok Street Food Tour (purchased locally) , $40 pp through May 2019; $45 pp from Sep 2019 onwards . This morning, venture on a street food tour of Bangkok! Stop by Wat Suthat, one of the oldest and largest Buddhist temples in Bangkok. Wander down quiet streets to a small, historic coffee shop for old-style Thai coffee, then continue to a stall making ‘khanom thua paep,’ a unique rice crepe. A few steps away sample another local specialty, ‘qui chaii,’ a dumpling stuffed with delicious vegetables. Along your walk you will come to the Chinese Chao Phor Suea Shrine to view its unique tiger god image. Then, enjoy a visit to a coconut ice cream shop. More food awaits as you discover a small market and browse the stalls selling fresh seafood, fruits, spices and more. Learn about the local market culture and uses for some of the more exotic ingredients on sale. After this tasty experience, walk through the neighborhood to visit a Buddha statue manufacturer to witness the process of making the statues. Afterwards, transfer back to the hotel with a full belly and a greater understanding of Thailand’s food culture. Optional Excursion: Calypso Cabaret Show (purchased locally) , $45 pp through May 2019; $48 pp from Sep 2019 onwards . This evening, transfer to the Thai dance show at Calypso Cabaret, one of Bangkok’s renowned shows. Calypso Cabaret is located at Asiatique the Riverfront, which is a famous night venue for dining, shopping and entertainment, and features its unique setting with a panoramic view of the Chao Phraya River. Afterwards, transfer back to your hotel. Full Day Itinerary: After breakfast, board a private long-tail boat on the peaceful Klong Bang Luang. Pass by shop houses, local temples and vendors on this waterway which was once a major trading route, and is lined with the impressive homes of aristocrats. After observing this lively area, the boat stops at Baan Silapin, a 100 year old renovated house, now home to an art gallery. Spend some time to enjoy the gallery, take part in an art workshop or explore the local community. En route back to the city, visit the Royal Barge Museum, to see the decorated ceremonial barges of the Royal family. Later, stop at the Temple of Dawn, also known as Wat Arun, on the banks of the Chao Praya River. The afternoon is at leisure to explore Bangkok on your own, or join a locally available optional excursion. Optional Excursion: Visit to Wat Trimitr & Wat Benchamabophit (purchased locally), $40 pp through May 2019; $48 pp from Sep 2019 onwards. Enjoy an afternoon tour through the hustle and bustle of Bangkok to visit some of Bangkok’s hidden gems. Visit Wat Trimitr, on the edge of Chinatown, which houses the world’s largest solid 700-year old golden Buddha, and followed by a visit to Wat Benjamabophit, also known as the marble temple featuring a fusion of Thai and European styles. Optional Excursion: Muay Thai Show (purchased locally), $72 pp through May 2019; $76 pp from Sep 2019 onwards. In the evening, transfer to your Muay Thai live Show. Created by acclaimed director Ekachai Uekrongtham, Muay Thai Live: The Legend Lives is a spectacular stage show about the history of Thai boxing, from its origins to present day. The show is presented in five thrilling chapters – The Tiger King, The Prisoner with Eight Limbs, The Warrior with Broken Swords, The Lethal Art of Muay Thai, and The Modern Action Hero. It also includes Muay Thai Live Boxing: Warrior Rising. A unique program that shows how the ancient and sacred art of Muay Thai has evolved into one of the most spectacular martial arts in the world. Accommodations: 1 night U Inchantree, or similar. Included meals: Breakfast & dinner. Full Day Itinerary: After an early breakfast this morning, depart Bangkok for the famous Damnoen Saduak Floating Market in Ratchaburi Province. Take a boat ride along the canal to see the colorful floating marketplace, bustling with boats and vendors selling tropical fruits and other delights. Then, continue to Kanchanaburi and visit the famous bridge of River Kwai and the Second World War cemetery. Next, visit the Hellfire Pass Museum before embarking on a short trek through the nearby canyon. The walk is along the Memorial Walking Trail which looks out on to Myanmar. A free audio guide is provided to help re-create the scene, linking the context and location with real life experiences, narrated by POW's while working on the line. This evening, enjoy dinner at your hotel. *Please note the indoor portion of the Hellfire Pass Museum is currently closed due to renovations. The outdoor section of this memorial, dedicated to the World War II POW's who built the infamous Death Railway, remains open. During this time, the museum will move some informative materials to their outdoor exhibit and will continue to provide an interactive head phone tour while viewing the outdoor exhibit. Accommodations: 2 nights Imperial River House Resort or similar, Chiang Rai. Included meals: Breakfast & lunch. Full Day Itinerary: After an early breakfast this morning, depart Kanchanaburi and travel to the ancient city of Ayutthaya, a UNESCO World Heritage Site. King U-Thong founded the city in 1350 as the capital of his kingdom of Siam. By 1700, Ayutthaya had as many as a million inhabitants, making it one of the largest cities in the world at the time. But in 1767, the city was invaded and destroyed by the Burmese army. Magnificent ruins of the old city still remain, some having been restored. Exciting archaeological excavations are still proceeding at many sites in the area. Among the ruins, discover the Wat Mahathat, a sculpture of a Buddha head sticking out of winding tree roots. Visit Wat Yai Chaimongkol, a temple best known for its enormous statue of the Reclining Buddha. Conclude the tour at Wat Chaiwattanaram, a monastery commissioned by King Prasatthong in 1630 in honor of his mother. However, its striking resemblance to Cambodia's famous Angkor Wat has led some to believe that the King also built the wat to commemorate his victory over Cambodia. After lunch at a local restaurant, return to Bangkok in time for your flight to Chiang Rai. Upon arrival in Chiang Rai, you will be met and transferred to your hotel. Full Day Itinerary: This morning embark on a full day tour to visit the Doi Tung region. En route to Doi Tung, visit various hill tribe villages. In the past, the forest area around Doi Tung was destroyed by shifting cultivation. In 1987, the Doi Tung Development Project was established according to the King's Mother's initiative in order to protect the region, eradicate the cultivation of opium, and encourage farmers to use sustainable agricultural practices. Visit the Mae Fah Luang gardens with its beautiful flowers and shrubbery. 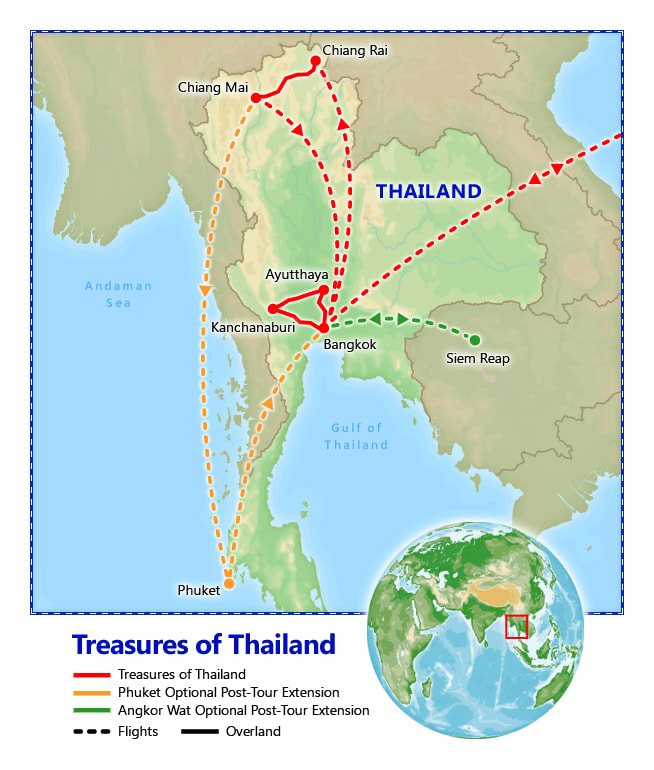 In the afternoon, drive to the Golden Triangle, where the borders of Thailand, Myanmar and Laos converge. Visit the ancient kingdom of Chiang Saen on the steep banks of the Mekong River, across from Laos, where you will see magnificent ancient ruins and temples. 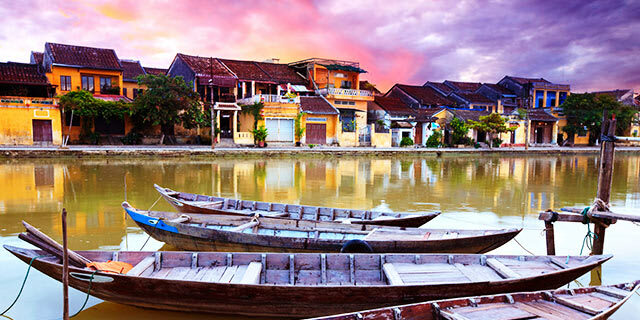 Then embark on a long-tail boat and see the area from the majestic Mekong River's perspective. Accommodations: 3 nights Na Nirand or similar, Chiang Mai. Included meals: Breakfast & lunch. Full Day Itinerary: After breakfast at the hotel, depart from Chiang Rai and continue to Chiang Mai, Thailand's second largest city, often called "Rose of the North" because of the abundance of flowers that thrive in its cooler mountain climate. En route visit Wat Rong Khun, also known as the White Temple and one of the must-see sights of the northern region. The temple features unique architecture and amazing drawings. Next, enjoy lunch at the Bakanaz Restaurant, which is located on a beautiful pineapple plantation. Arrive in Chiang Mai late this afternoon. Stop by the Borsang Handicraft Village to see a demonstration and learn about the work of local artisans. Afterwards, enjoy your evening at leisure. Full Day Itinerary: This morning, travel to Wat Phra That Doi Suthep, built in 1384 and one of the most revered temples in Thailand. Climb the 309 steps of the Golden Naga staircase to reach its golden pagodas. Inside the cloister of the temple, you will see one of the most sacred stupas. Walk around the compound and admire the many bells and statues of Buddha. Afterwards, enjoy a delicious bowl of Khao Soy. This famous Northern Thai dish is a combination of coconut cream, crispy noodles and plenty of spice that is sure to delight! Optional Excursion: Cooking Class at Baan Hongnual (purchased locally), $36 pp through May 2019; $38 pp from Sep 2019 onwards. Join a Thai cooking course at a Lanna-style teak house, Baan Hongnual Cooking School, located in Sarapee District. Learn the art of Thai cooking from master cooks in a typical Thai kitchen. Gather herbs and local vegetables from the garden and prepare them to create various types of mouth-watering dishes. Full Day Itinerary: Visit the Palaung, Akha and Lisu hill tribe villages. Living separately from the lowland, the hill tribe people retain a different culture and unique way of life. On the way back to Chiang Mai, visit an orchid and butterfly farm. This evening, join your fellow travelers for a farewell dinner. Or, take advantage of your already-included international airfare and join our optional extensions to Angkor Wat and Phuket Island or both! *NOTE: Due to high water levels during and closely following monsoon season (summer into early winter), select sites among the canals may have restricted access. If any sites are temporarily restricted, equally enjoyable visits will be added in its place. Take advantage of your already-included international airfare by joining our extension to Cambodia for a special opportunity to visit Angkor Wat, a massive complex of temples that ranks among the most fascinating religious sites in the world. For JFK passengers, the Angkor Wat Extension must be arranged on a custom basis to be coordinated with China Airlines' JFK schedule which may require flying form Siem Reap to Phnom Penh on Day 14 and overnighting in Phnom Penh; please contact us for details. Accommodations: 3 nights Sokha Angkor Resort or similar. Included meals: Breakfast. Full Day Itinerary: Built by the Khmer civilization between 802 and 1220 AD, the temples at Angkor and the great city that surrounded them represent one of mankind's most astonishing and enduring architectural achievements. The structures you see today are the surviving remains of a grand religious, social and administrative metropolis whose other buildings—palaces, public buildings, and houses—were built of wood and have long since decayed and vanished. Satellite photographs reveal Angkor to have been the largest preindustrial city in the world, with an urban sprawl of 3000 square kilometers (the closest rival is Tikal in Guatemala, at most 150 square kilometers) and supporting a population of up to one million people. Mysteriously abandoned in the 15th century, the Angkor site remained largely cloaked by the forest until the late 19th century, when archaeologists began to clear away the forest and embark on a long restoration process that continues today. After breakfast, begin your explorations at the mysterious walled city of Angkor Thom, the last capital of the Great Khmer Empire. The city is surrounded by an 8 meter high wall, drawing a perfect square, 4km on each side. Enter the city through the South Gate, an impressive stone entryway flanked by larger-than-life carved elephants and capped with four giant smiling faces of the Buddha. On each side of the entrance path stands a row of 54 gods and demons, each holding a sacred Naga snake. Continue to Bayon Temple, located in the exact center of the city of Angkor Thom. This monument includes dozens of towers featuring faces that some believe depict King Jayavarman VII represented as a Buddhist deity. While the scores of faces are nearly identical, the staggered height of the towers and the different viewpoint of each keep the design from appearing repetitious. Atop the temple, you are engulfed by the silent, enigmatic gaze of those faces, through half-closed eyes, staring out from a remote time in history. After lunch at a local restaurant, explore the temples of the Small Circuit. The most famous is Ta Prohm temple, built in the mid-12th to early 13th centuries. Ta Prohm is unique in that it has been left largely as it was found: overgrown by jungle trees and vines, with many parts of the temple crumbling to the ground, giving it the most mysterious atmosphere of the temples in the Angkor area. Continue to the magnificent Angkor Wat archaeological site, built by Suryavarman II in the early 12th century. Inside the temple, the walls are covered with carvings and bas-reliefs depicting Hindu mythology and the history of the region. This evening, enjoy dinner at a local restaurant. Visit the "Citadel of Women"
Full Day Itinerary: This morning's excursion takes you to the "Citadel of Women" of Banteay Srei and Banteay Samré, considered to be the birthplace of Khmer classical architecture. After lunch at a local restaurant, visit three early-Angkor era temples of the Roluos Group: Preah Ko, Bakong, and Lolei, built by King Indravarman I and his successor in the 9th century. Note: JFK schedule may require flying from Siem Reap to Phnom Penh for overnight continuing back to the USA from Phnom Penh on Day 15. Take advantage of your already-included international airfare and enjoy a luxurious and relaxing stay on Phuket Island, Thailand's most famous resort. Full Day Itinerary: Two full days at leisure to relax, shop or tour this scenic island, Thailand's largest. Phuket and the 39 smaller islands to the southeast are studded with tropical forests, mountains, gravity-defying limestone formations, and pristine beaches, surrounded by coral reefs and the aquamarine water of the balmy Andaman Sea. The west coast of Phuket was hit severely by the Indian Ocean tsunami of December 2004, but the resilient people have quickly rebuilt, and almost no evidence of the damage now remains. Phuket is a melting pot of Buddhists, Thai-Chinese, Muslims, and even sea gypsies, whom you'll find warm and welcoming. Phuket is also the sailing and yachting center of Thailand and adjacent countries, with several races and regattas happening throughout the year. And in the unlikely event that you can pull yourself away from the beach, you'll find opportunities to ride horses, hike, mountain bike, and even golf. Afterwards, unwind at one of the many spas or one of the excellent acrobatic, theatrical or cultural shows. Join an optional tour to the breathtaking Phi Phi islands. 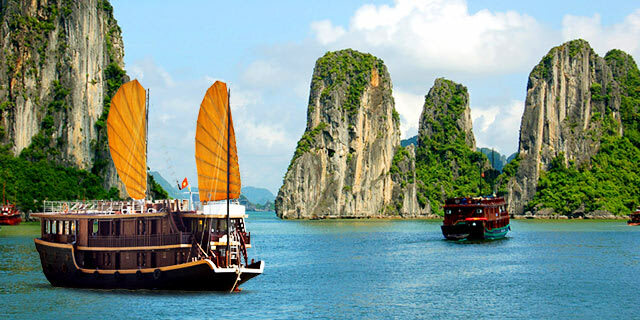 Take a trip by boat and bus to Phang Nha Bay and to the limestone spire known as "James Bond Island" for its role in The Man with the Golden Gun. Na Nirand Romantic Boutique Resort is a charming hideaway nestled in the heart of Chiang Mai. Legendary stories combined with the history of the area are inspiration behind the creation of this unique resort. What should I know about Cambodia? Check out our guide for travel tips, the best time to go, blog posts, videos, and more.